« Enjoy a Scenic Casco Bay Cruise! The 2015 Bowdoin International Music Festival is in full swing already – running from June 27th through August 8th – but there are still plenty of great concerts left to see! Every summer, Bowdoin College in Brunswick heats up the Maine coast with the Bowdoin International Music Festival, bringing renowned musicians and instructors from around the world six weeks of performance, collaboration, and learning to Bowdoin College – not to mention world-class entertainment to audiences in the form of more than 100 concerts, seminars, and related events. This year’s Bowdoin International Music Festival theme is “Music: The Art of Friendship” with concerts designed to illuminate the relationships between performing musicians, music students and their instructors, and between composers and musicians. A full schedule of concerts and other events can be found here but highlights of the Bowdoin International Music Festival are set to include include Brahms String Sextets, Mendelssohn’s Octet, and performances by Steven Doane, Ilya Kaler, Paul Katz, Jennifer Koh, Mikhail Kopelman, Peter Serkin, and the Dover, Miró, Pacifica, and Ying Quartets. Monday Showcase, with four different string quartets performing works for quartets alone and in collaboration with other musicians. This series is scheduled to include the Dover Quartet, Miró Quartet, Pacifica Quartet, and Ying Quartets. Wednesday Upbeat! is a mid-week series offering a mixture of both classic and contemporary compositions from Festival artists in a casual setting. 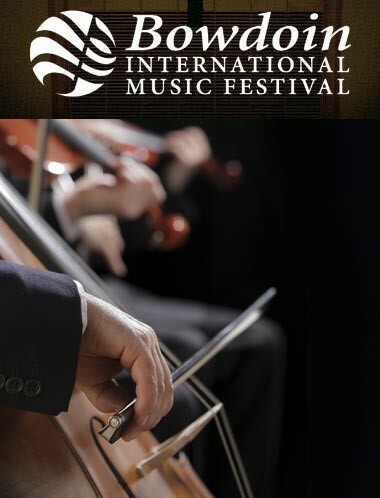 Festival Fridays is the festival’s premiere showcase of traditional chamber music and orchestral repertoire performed by master musicians from all over the globe. The Gamper Festival of Contemporary Music, July 30th through August 2nd, presents the works of 20th century and contemporary American composers, including the Festival’s composers-in-residence, guest composers, and top participants. If you enjoy contemporary classical, you’ll not want to miss this series! Brewster House Bed & Breakfast is only a 15 minute drive from the Bowdoin College campus and Bowdoin International Music Festival. That’s the advantage of having your Maine Coast home base in Freeport – it’s convenient location has you just minutes from all the best attractions and events in the area, yet is quiet enough to allow you to get what you really want: real relaxation! Let Brewster House Bed & Breakfast help make your Maine getaway the best it can be!